This purse is not only stylish but also well made and sturdy. It's large enough to hold everything with smaller pockets inside so your phone, keys or other small items are easily accessible. What more could you ask for? This satchel's fabulous barrel body design will make you want to get it in every color. Stay care-free and fashionable in a rich color palette including red, classic black and warm green and tan. Layer it up with scarves, jackets and tights; all of your favorite warm and cold weather classics only make this bag your coffee shop companion. This is a Great purse with pockets in all the right places. It's very well made and super sturdy. It's a classic that I sure I'll get a lot of use from. The color was tan but online it looked like a mustard yellow. It's more like a tan color. Borderline baby poop ish. I love this handbag. I can get my 10 inch kindle and everything else I need in it with no problems. I’ve been searching for an everyday purse and I’ve found it! I bought the coffee color. Absolutely love this purse! Have had complements on how nice looking it is. Where did I get it at? Is exactly as pictured. Very sturdy. Arrived welll package and very quickly. Just what I needed. Not too small and not too big. 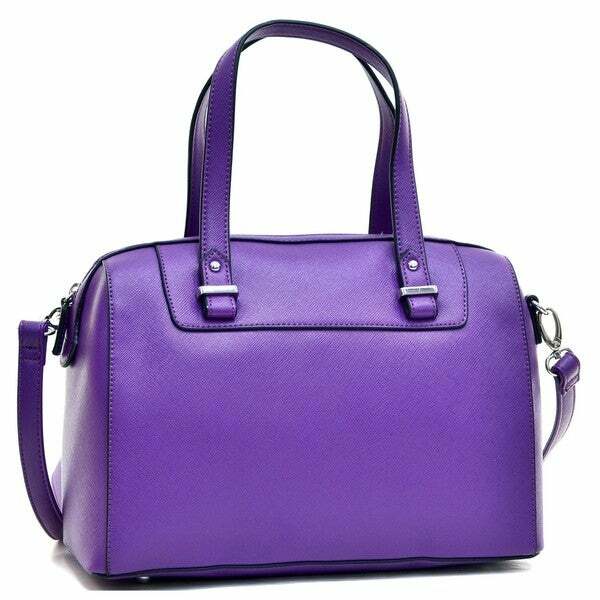 "Does this purse come in the color purple I don’t see purple in the drop down box"
Currently the purple color is not in stock.